Was back to another busy day, today, dentist appointment, from there I picked out my birthday gifts (Son, Daughter, Son in law gave me $75 to spend at the Halloween store..they know me way too well. 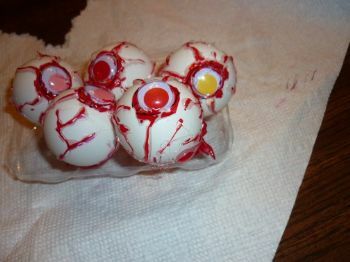 *L*) I had such a great time, then I hunted down things to make for Halloween. Finished one of them, working on the others. I can't wait until I'm done. 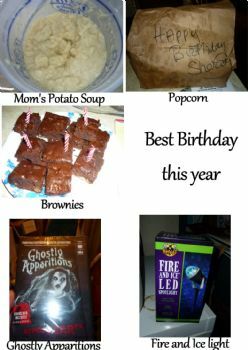 These are my birthday gifts; my Mom has made me potato soup for as long as I can remember; my sister made popcorn (without butter, etc); and my kids gave me money to get what I wanted at the Halloween Store, and that's what I got. That light is amazing, it looks like water rippling..it's perfect for my cemetery..and the Apparitions DVD....that is amazing, look it up online sometime and see for yourself. It's so cool. Have a great rest of the week and share those smiles! Hugs for you all! LOVE the milk jug spooks! I love that your choice of fantastic birthday gifts are things for Halloween! You'll have a great time getting ready for and enjoying the big H. And I know those who get to see all of your hard work will enjoy it also. Let us enjoy it too by sharing in a blog your final products and reactions that you get.